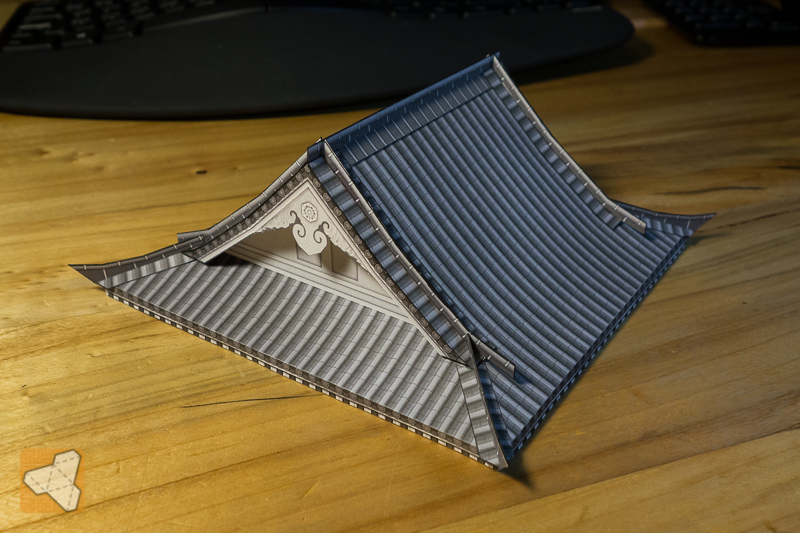 Is it possible to have the walls fold flat and the roof pieces nest together? 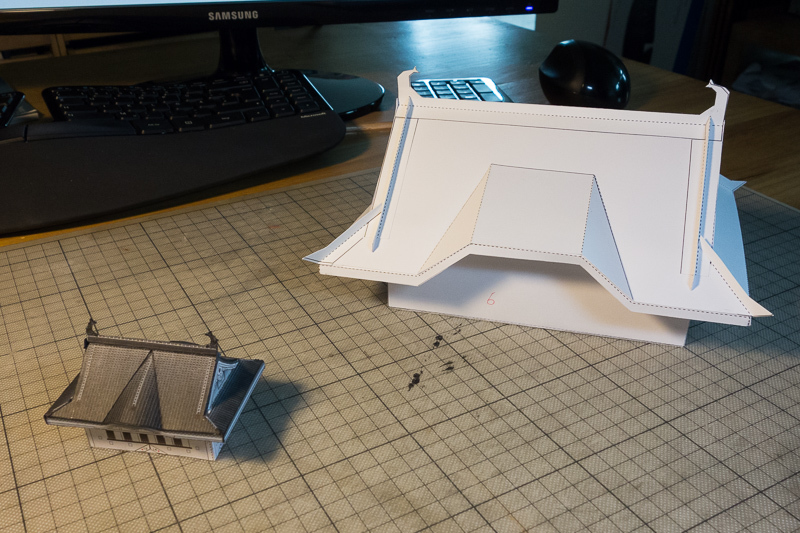 That might make the roofs nest more nicely, if the dormer parts were detachable/fold flat. Vermin King: What does nest mean? oldschooldm: Thanks for the inspiration. I will try that. 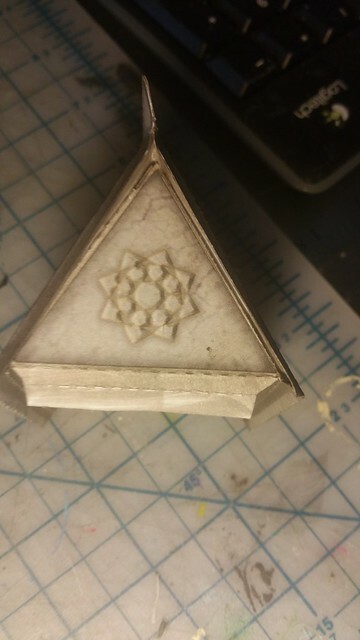 One thing I need to figure out with the roof parts is how to add the ornament part at the edge. Or have it with the edge and maybe even do something connect-wise. If stacking is a possibility this should work well. I have tried it to make sure and the height is a little over 5cm. I still will see if I can come up with some connect/disconnect way for the roof parts, because it would enable to reusing of the parts to form a rectangle or a square building for example. I really like the idea of the roofs nesting, I would leave them glued together for strength. This is an awesome idea. convinced! I guess the number of people building more than one castle might be limited and I agree, if I would and will build it, I will glue for strength. During some problems I ran into with the add on roofs I found that my model looks more like a stave church than a Japanese castle. So right now I am in the process of redesigning the roof angles so that it looks more like it should. Isn't it weird how you can find blueprints of any (not real) Star Trek and Star Wars spaceship but hardly anything accurate or readable for the castle? Yes, indeed. I was thinking that I would be able to cobble together something close to the Blarney Castle, and couldn't find so much as a tour floorplan. Have been trying if I can get the roof looking more Asian and came up with this. It's without the ornaments so it will be looking better with them but I think it's looking better, no? As it is a little more effort to build it this way I will make this optional. 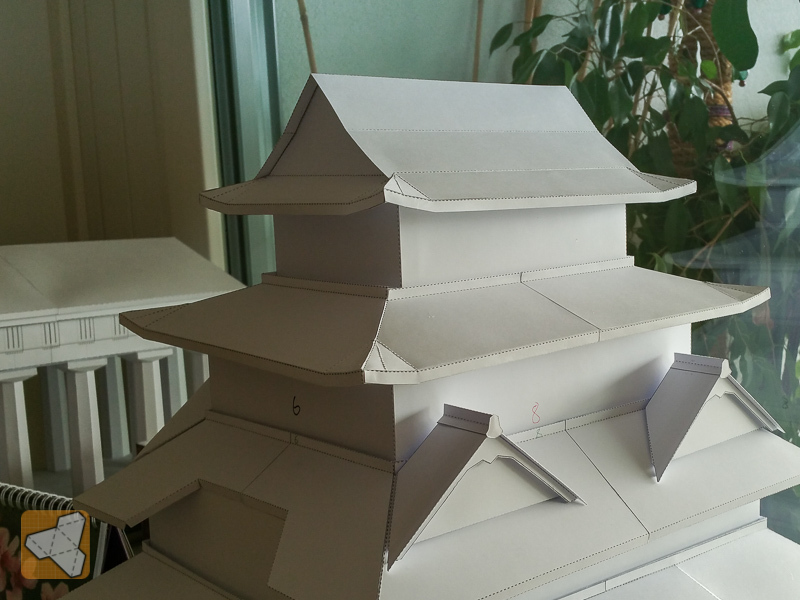 Due to some problems I have with the analysis of existing castle elements I thought I am going to build the free Himeji castle model by Canon Papercraft. I want to have something on my desk that I can look at and get a feel of all the dimensions and proportions. Except for the few problems that I hope to solve soon, I am very happy that my solution so far is turning out very good compared to this other model. The biggest difference will be that I simplify the rounded roof sections for easy of building. ... I think Let's see what the Canon version reveals once completed! I know what you are saying about the curved surfaces. While I like Asian Series project very much - what brings my attention is a Greek (Partenon-like colonnade?) temple visible in the photo background. Is it finished, released or just a work-in-progress stage? mesper: Haha, forgot to hide that one. Not released but almost finished. I need to add some texturing, add some stabilizers to the roof and make the floor cover parts. 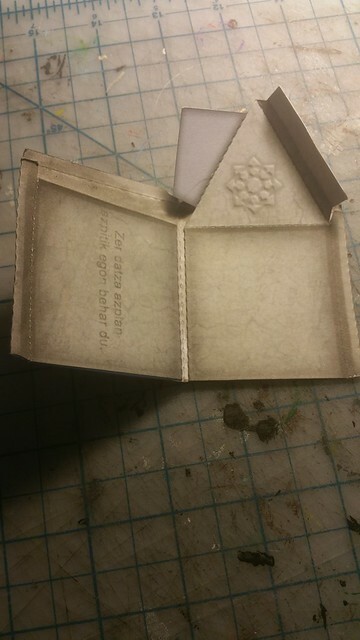 Right now it's showing the naked floor modules (in case one does want to make it paper only. Of course you could also use corrugated cardboard or styrofoam). It's one of the things I have been working on last year. 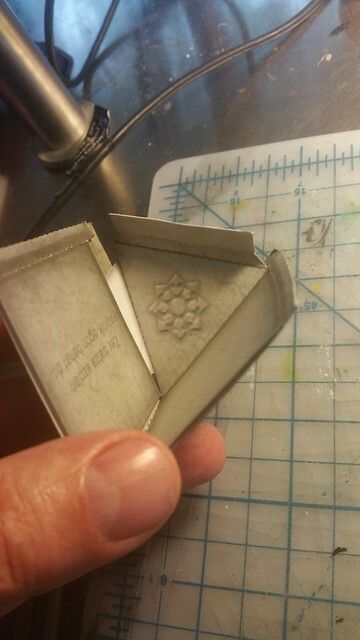 The special thing about it is that is, well not fold flat, but separatable and the columns are super sturdy. I also have designs for a round temple! I have planned to do it at a later stage but if there is much interest I could move that one to the top? Things are starting to come together after some time of restructuring. I finished the roof and ornaments textures and did a b/w test build. The roof is curved but I glued the sides on without scoring so it looks "uncurved" like the real thing! Actually my first thought was that roof should be covered in Ninjas fighting each other. Finally, a reason to bust out the six pages of okumarts ninjas that I printed and cut for no particular reason! We need walls for the ninja roofs! The "Matsumoto" style textures for the walls are coming along. I also have the "black" roof wall but have not come around to build a new roof yet. I am focusing on the tower now. I will split the whole castle into subsets in order to be able to publish smaller chunks earlier. The entire castle would probably take a little while longer. I am thinking Tower, Walls, Gate, Building and finally the XL extensions. With that the ones interested can start building and not be overwhelmed with a huge castle set. 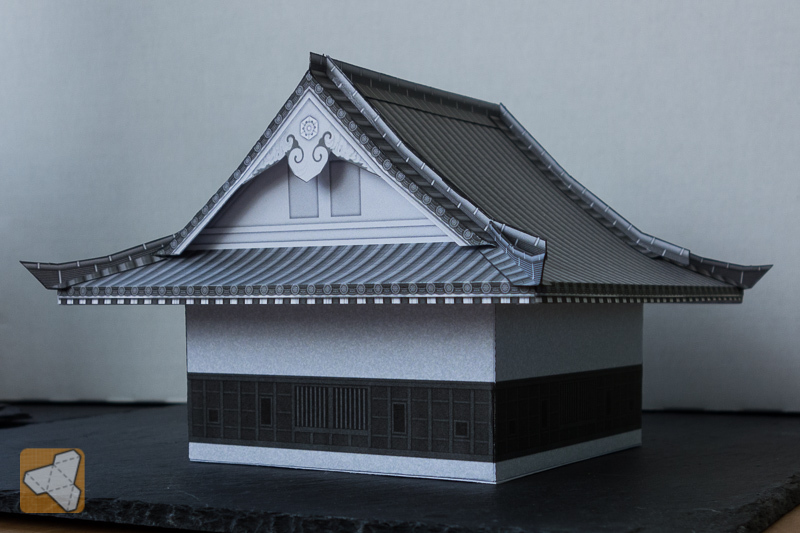 I think it will be right to call this the "Samurai Castle Builder" series. What do you think? I like it lots! 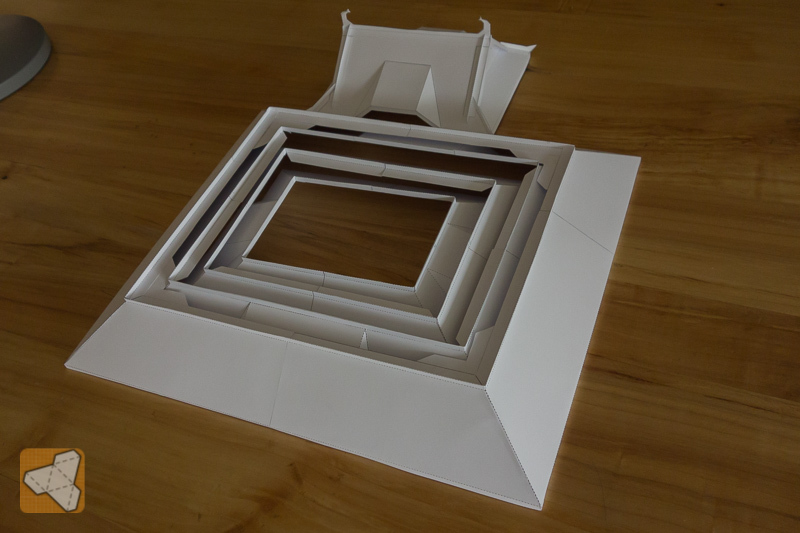 BTW could be have some paper catwalks that hook onto the detail that runs down each corner?. That is a good idea. A samurai "castle" is really a collection of connected buildings, much like many English castles start with a round Norman style tower and then grow out from there. I plan to do walls and smaller buildings connecting each other. 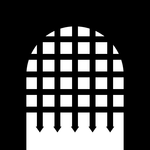 I also want to make the raised stone/wall foundations in a way that allows to form a "spiral" of walls, gates and towers as the real castles usually are (but maybe in a simpler fashion). Do you have pictures of what you are referring to? 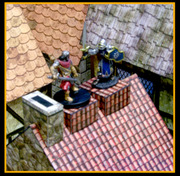 Something that allows a mini to sit on the roof where there would not be a flat place in real life, but would aid in play to allow for the daring do of characters scampering all about. 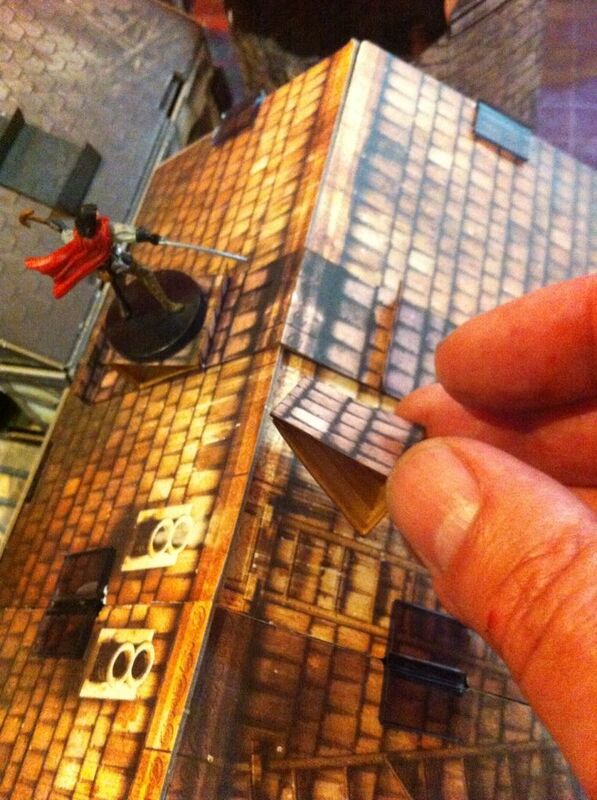 I thought that the detail might allow a "rail" of paper to be strung across so that a base could sit on it and the roof. Ahhh! Now I get it. Yeah sure that's a great idea to facilitate roof top battles. Might I suggest the adapter I designed to be compatible with all roofs?